small stones – Yay Words! At the speed of snow Indiana sinks back in my bones. Every Road Will Take Me Down to the Sea. I’ve been debating a couple themes for a new challenge a while now, but this one received the most attention when I asked others about it, and one I keep coming back to myself. I do intend to do one about the open road/wildflowers at some point though, as I think it’d be great to see it alongside the current challenge. Although I’ve never been much of a beach goer and not particularly fond of swimming where I can’t see what’s in the water with me, I’ve always been fond of the sea. I love water, and being out in boats. So much lies below the surface, regardless how cliche that sounds, whether it be sea creatures or Atlantis. But even the surface itself feels surreal to see the edge of the sea meet the horizon. Meanwhile, I’m also quite fond of thief characters in stories. Usually because thieves, in fiction, traditionally are outsiders, rogues, and live on the fringes of society. They are not exactly antiheroes, but often cannot be labeled as clearcut good or bad. On occasion, they fill a similar role to the Shakespearean fool. Like the sea, thieves are romantically mysterious, can be dangerous, and often have a wealth of treasures hidden somewhere. I will take small poems until Saturday, September 15th about the sea and/or thieves/thievery. As I have with other projects, I will take up to 5, and I’ll at least take one. I reserve the right to ask you to try again if nothing really catches my eye, but don’t take it as a brushoff; that really does mean try again! Theme/What to write about: The sea and/or thieves/thievery. What form: Haiku, senryu, tanka, kyoka, gogyōka, renku, haibun, haiga (doodles most welcome! ), small stones, short poems (up to 10 lines), etc. As is art! How many: As many as you want! I will take as many as 5 and no less than 1. When: Send them in by Saturday, September 15th (I will wait until the whole world has reached the 15th); I will post a PDF on this blog on September 19th (or as some know it, International Talk Like a Pirate Day). Where to send: Either leave a comment to this post or send an email to aubriecox [at] gmail [dot] com! If you email, put “EVERY ROAD TAKES ME TO THE SEA” in the subject line, if you please. • You, as the writer/artist/poet/etc, retain the rights to you work before and after it appears on my blog/in the PDF. • If you want me to link back, please send along the name and link of your blog/Twitter account/website/etc! Also, make sure your have your name listed as you would like for it to appear. I hope those of you who wrote like mad through April are starting to catch your breath, because it’s time to pick up those pens and pencils again. The summer solstice is a little over a month away. So in case you need an excuse to write poetry . . .
Not only does my name derived from the same origins as Oberon (i.e. Alberich), A Midsummer Night’s Dream is one of my favorite Shakespearean plays. And with the summer solstice being the longest day of the year, it seems only fitting to incorporate light in some way (and as some of you know, I just really love lanterns). That being said, I will take small poems until Sunday, June 17th about faerie folk (elves, dwarves, faeries, mermaids, etc) and/or lanterns. As I have with other projects, I will take up to 5, and I’ll at least take one. I reserve the right to ask you to try again if nothing really catches my eye, but don’t take it as a brushoff; that really does mean try again! Theme/What to write about: Faerie folk (elves, dwarves, faeries, mermaids etc) and/or lanterns. What form: Haiku, senryu, tanka, kyoka, gogyōka, renku, haibun, haiga (doodles most welcome! ), small stones, etc. As is art! When: Send them in by Sunday, June 17th (I will wait until the whole world has reached the 17th); I will post a PDF on this blog on June 20th. Where to send: Either leave a comment to this post or send an email to aubriecox [at] gmail [dot] com! If you email, put “MIDSUMMER” in the subject line, if you please. Dragons, small stones, and one year of Yay Words! To be honest, I wasn’t sure I could keep this blog going for a year—I’ve never been able to keep a public blog going more than a few months at best. There’ve been a few dead months, and wobbled a bit in December, but I made it! Starting out with a bang, I’ve uploaded The Language of Dragons, boasting 61 poems and 39 poets/artists, to celebrate the New Year. I’ve said thanks probably fifty times already, but once more, thanks to everyone who has read and contributed over the last year. Since everyone seemed to enjoy “Tea with Trolls” (PDF, by the way, is now available for download on the page), I did a quick poll of what you all wanted to write about next, and dragons won by a landslide. Which is fitting, since the year 2012 is the Year of the Dragon, specifically the water dragon. 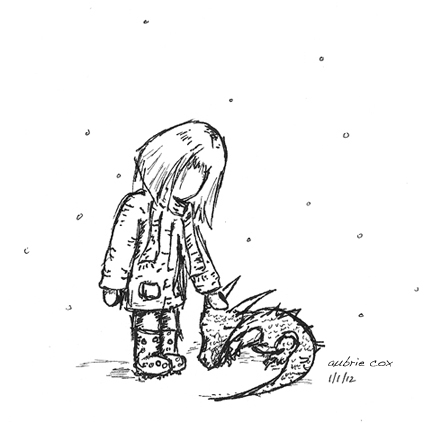 I will take small poems until Wednesday December 28th about dragons and/or water and/or fire (something to warm us in the middle of winter) to prepare a post for New Year’s Day. As before, I will take up to 5, and you’re guaranteed at least one poem just for sending me something! Theme/What to write about: Dragons and/or water and/or fire. What form: Haiku, senryu, tanka, kyoka, gogyōka, renku, haibun, haiga (doodles most welcome! ), small stones, etc. When: Send them in by Wednesday, December 28th (I will wait until the whole world has reached the 28th); I will post a PDF on this blog on New Years Day. Where to send: Either leave a comment to this post or send an email to aubriecox [at] gmail [dot] com! Given my most recent doodleku, it was only a matter of time. I’ve been watching Melissa’s posts on Red Dragonfly since she started doing the collections such as with mushroom haiku and dragonfly haiku and have been thinking to myself, “… I’d like to do one with tea.” I love writing about tea, you see. It’s not exactly an uncommon subject of poetry, but I don’t think it’s overdone either. But then I realized it was October. Although I haven’t written very many, I do soever love troll ‘ku as well, and any time I write about trolls, I seem to always incorporate tea. (Allow me to present Exhibits A and B.) So, of course, the only sane thing to do would be to bring the two together for a monster mash on All Hallow’s Eve. I want your haiku, senryu, tanka, kyoka, renku, haibun, small stones, etc about tea, trolls and tea, just trolls, or any sort of monsters with or without tea. Send previously published work or not. Both okay, but keep in mind any you send and that are posted will be then considered published by the majority of the community. Send as many as you would like by October 29th, though I will likely take up to 5 for posting. You’re guaranteed at least one poem just for having submitted. Then, on Halloween, I will make a post with everyone’s work. It’s sure to be a treat. Theme/What to write about: Tea and/or monsters. When: Send them in by Saturday, October 29th (I will wait until the whole world has reached the 30th); I will post them on this blog October 31st. • You, as the writer/artist/poet/etc, retain the rights to you work before and after it appears on my blog.